After lunch, all the choirs sing their pieces. (Photos of the individual choirs are on our Facebook page). Then we go to our homerooms and share our thoughts about the music. 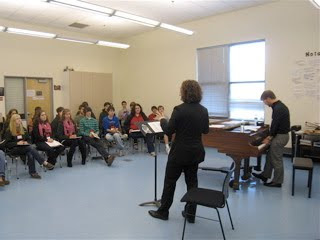 The Darien High School Tudor Singers were working on Dylan's absolute favorite piece of music - Byrd's Ave Verum Corpus.